100-watt modelling combo amplifier from Vypyr series that uses the Variable Instrument Input which can provide amplification for a variety of instrument types: it contains bass guitar, acoustic guitar and electric guitar amplifier models that can morph into each other and also allows the electric guitar player access to instrument models. It provides over 400 amp accessible presets, 10 instrument models (including Acoustic guitar simulations, 12 String guitar model, Sitar model, 7 String model, Baritone model, Resonator model, Electric Violin and Bass guitar models), 12 amp accessible stompbox models plus delay, reverb and wah, 36 on-board amp models, 6 bass amp models and 26 total on-board amp accessible effects plus Tap Tempo. Amplifier utilizes a combination of powerful 32-bit, floating point SHARC processors and patented Transtube analogue circuitry to create the best sounding modelling amplifiers available. It is equipped with one 12” custom voiced modelling speaker, providing PowerSponge 100 W to 1 W variable power, an LCD screen for quick preset, model and effect selection, and enhanced chromatic tuner. WYSIWYG control surface quickly allows the user the ability to see and adjust the control position, while the USB bi-directional data and audio port provides an easy way to record or connect the amplifier to computer. Cabinet features an acoustically ported semi-closed back and provides a studio quality headphone output and an aux/mp3/CD input. 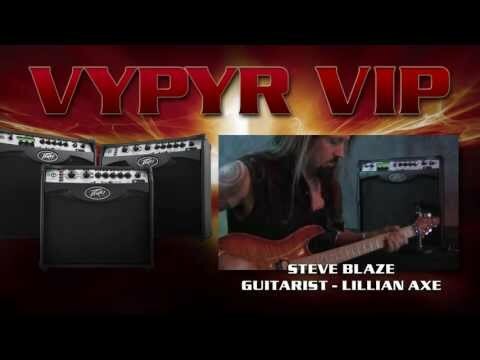 Do you own Peavey VYPYR VIP3 or have you had a chance to try it? Kombo spĺňa všetky moje očakávania a keď sa s tým človek pohra, dajú sa nastaviť zvuky podľa očakávania muzikanta. Výborný aparát, veľa zvukových možností, pre lepšiu a rýchlejšiu variabilitu pri živom hraní treba dokúpiť pedál Sanpera I alebo II novšieho typu (čierne prevedenie). Odporúčam. Az erősítővel minden rendben van. (Már a másodikat vettem belőle.) A hozzá kínált Sanpera-pedálokkal kapcsolatban azonban borzalmasan rosszak a tapasztalataim (az olcsóbbik javíthatatlan volt, visszaadtam, a drágábbikat pedig hónapokig javították, kvázi nem merem használni).